“Consumers might not realise it, but whereas up until a few years ago almost all the pork sold on the island was locally grown, today that share has dropped to around 30 per cent. It’s getting to the point where many farmers are just giving up,” he said. The problem they face is pretty straightforward: foreign pork is far cheaper to produce than it is on Malta because farmers here have to shell out a bomb to import the cereal feeds that fattens pigs before slaughter. “So you see the cheaper imports aren’t translating into savings for the consumer, if anything consumers are opting for more expensive products such as pre-packaged, marinated or pre-cooked products,” Dr Frendo said. To make matters worse for local farmers, a minority of unscrupulous sellers have started flogging foreign meat as local to cash in on buyers’ preference for Maltese products. Lifelong farmer Mario Abela yesterday walked around his Żebbug farm, distraught. “It’s basically over for the sector. I don’t know how we are going to keep going on like this,” he said. The president of the pig farmer’s cooperative, Mr Abela said the situation was so bad that other farmers were turning to the cooperative for bridge loans just to be able to cover operating costs. “I don’t know what’s left for us. It is too hard to keep fighting on when the situation keeps getting worse and worse and no one seems to care about Maltese pig farmers,” he said. Prior to joining the EU, practically all the pork sold on the island was local – in fact, you would have been hard pressed, Dr Frendo says, to find foreign pork in Malta at all. While pig farmers in Malta used to sell around 2,300 pigs every week in 2004 – making up more than 90 per cent of the market share – last year they sold fewer than 1,000 carcasses weekly, despite increased consumption on the island. The result? 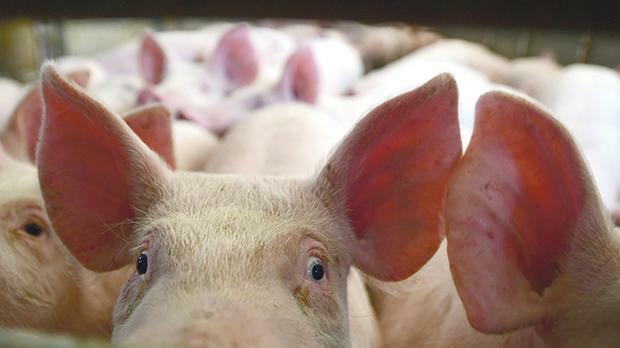 A dwindling market share of less than 30 per cent for Maltese producers, with a number of pig farms closing down in recent years. Back in 2016 farmers issued a statement pleading with consumers to buy local. European pork prices dropped suddenly that year and have remained low ever since, leading to a flooding of imported foreign pork on the island. “At this point, any further reduction in sales for farmers may cause the entire sector to become non-viable, risking the livelihoods of hundreds of local families,” the farmers had said. The local cooperative of farmers had tried to protect and promote their locally grown produce when they came out with a labelling system to help consumers make informed choices. Pork with the ‘Majjal ta’ Malta’ label was meant to be local, ethical and sustainable produce, or so consumers thought. Dr Frendo said the cooperative had released thousands of labels and stickers to distributors and sellers, however they had serious concerns that their inability to audit the system left it open to abuse and fraud. Farmers also complained of a situation where foreign-imported, mass-produced pork was being falsely labelled and sold as Maltese local produce. However it was unclear how widespread this practice was. Dr Frendo said the matter had been raised with the authorities but little or no action had been taken. Meanwhile, a new problem facing the sector was that of some sellers importing live pigs, only to slaughter them the next day and claim they were Maltese produce. The argument for locally grown pork is the same you’d hear any ‘eat local’ lobby say: food grown in smaller batches is more ethically produced and helps support local communities. Dr Frendo said that Maltese family-run pork farms had relatively small numbers of swine compared to the factory-farms on mainland Europe. But supporting the Maltese pork industry would also indirectly support other farmers too. Dr Frendo said the cereal feeds imported to grow Maltese pigs were the same used to feed dairy cows and poultry. If pig farmers decided to call it quits, other farms would have to bear the cost of importing feed, raising production costs. Pig farmers, he said, would just be the first domino to fall. Local producers, Dr Frendo said, depended on consumers for their survival. There is still hope for the sector. Dr Frendo said the pig farmers’ cooperative planned to try what dairy farmers had done to protect their trade. “Just as the Maltese dairy farmers market their product under the Benna brand to maintain reasonable control of their supply chain, we want to market more of the Maltese pig farmers’ products in a way that we can guarantee that the product really is local,” he said. While there were also other things like EU funds and government intervention that could help save the industry, farmers were hoping a recognisable local brand would help keep them afloat.